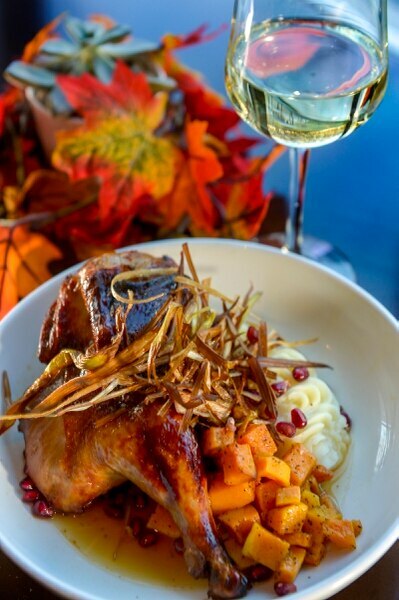 Leah Hogsten | The Salt Lake Tribune Maple-brined chicken, bourbon butternut squash, buttermilk mash potatoes, garnished with pomegranates and fried leeks at Thistle & Thyme restaurant, inside Salt Lake City's Marriott University Park Hotel. (Leah Hogsten | The Salt Lake Tribune) The dining room at Thistle & Thyme restaurant, located inside Salt Lake City Marriott University Park Hotel. (Leah Hogsten | The Salt Lake Tribune) The dining room at Thistle & Thyme restaurant, located inside Salt Lake City Marriott University Park Hotel. Leah Hogsten | The Salt Lake Tribune Salt Lake City Marriott University Park restaurant, Thistle & Thyme's Executive Chef Jason Talcott, has planned a traditional Thanksgiving buffet with turkey and traditional side dishes and a grazing stationâ with assorted charcuterie, cheeses, breads, a build-your-ownâ mac & cheese bar and assorted desserts. (Courtesy Photo) Pizzettas at Cena Ristorante, an Italian restaurant inside The Chateaux Deer Valley. (Courtesy Photo) Cena Ristorante, an Italian restaurant inside The Chateaux Deer Valley in Park City. Chris Detrick | The Salt Lake Tribune The interior of Finca, 327 W. 200 South, in Salt Lake City Wednesday November 18, 2015. Leah Hogsten | The Salt Lake Tribune l-r Photos of Father E.J. Flanagan adorn the walls of Flanagan's on Main, in Park City. 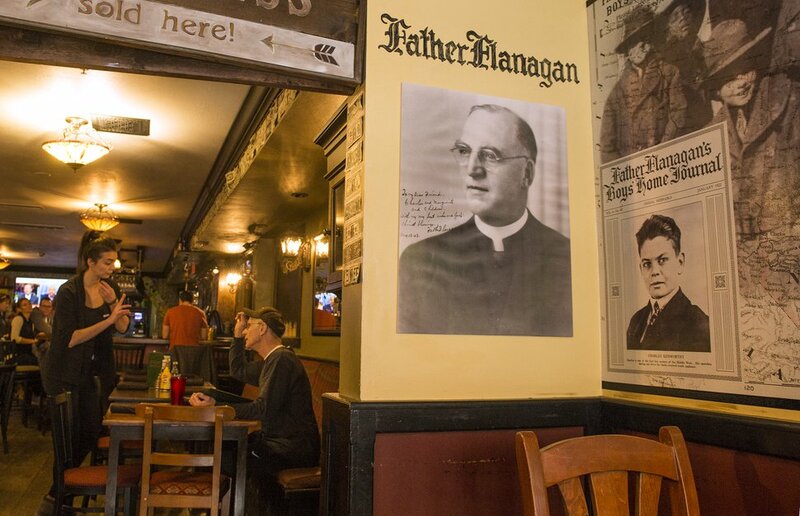 Leah Hogsten | The Salt Lake Tribune John Kenworthy, owner of Flanagan's on Main, points out his grandfather in the photos that adorn the walls of the Irish Pub in Park City. Scott Sommerdorf | The Salt Lake Tribune There is indoor and outdoor dining available at Hub & Spoke Diner, Saturday, September 5, 2015. Whether you’re looking for a casual Thanksgiving meal or an elegant holiday dinner, there is a Utah restaurant ready to serve you and your family on Thursday, Nov. 22. Most restaurants stick to the traditional menu of roast turkey with stuffing, mashed potatoes and pumpkin pie. But a few go rogue, offering prime rib, beef short ribs or salmon. 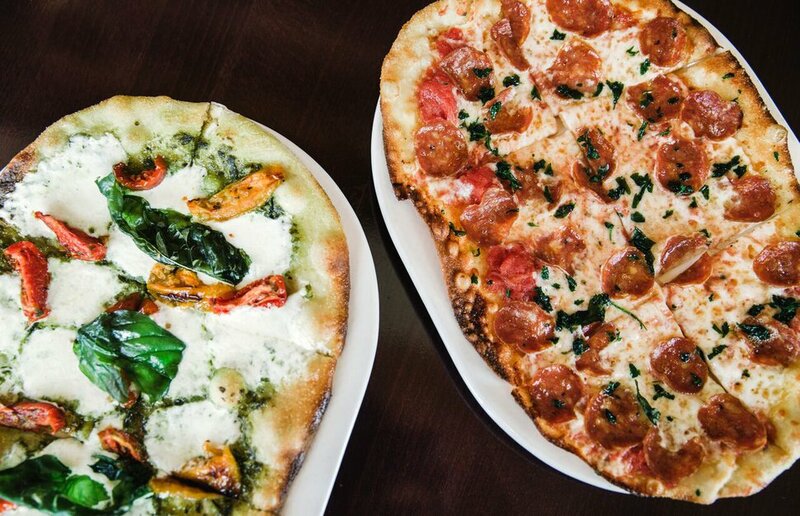 At one Salt Lake City hotel, there’s a build-your-own mac 'n' cheese bar and, at an Italian restaurant in Park City, you can order a personal-size pizza called a pizzetta. Take a look at the list below to see what is available. Prices do not include tax, tip or alcoholic beverages, unless noted. Also, since Thanksgiving is one of the busiest dining days of the year, it’s important to make reservations — even if the establishment is serving a buffet or doesn’t usually require them. Make that call soon. Two popular holiday dining options — The Grand America Hotel and the Glitretind Restaurant at Park City’s Stein Eriksen Lodge — already are sold out. Alta Lodge • 10230 E. Little Cottonwood Canyon Road, 801-745-3500 or https://www.altalodge.com/. A five-course holiday meal will be served from 5:30 to 8:30 pm. Includes starter, salad, turkey with sides and dessert. Vegetarian option available. Adults, $55, children 4-12, $22.50, 3 and under free. 801-745-3500. Café Niche • 779 E. 300 South, Salt Lake City, 801-433-3380 or www.caffeniche.com. Holiday meal served from 1 to 6 p.m., includes soup or salad, choice of turkey, meatloaf, salmon or pasta entree with sides served family style. Pumpkin pie, chocolate cake or raspberry sorbet for dessert. Adults, $45, children 12 and under $20. Chabaar Beyond Thai • 87 W. 7200 South, Midvale, 801-566-5100 or https://www.asooksri.com/about-chabaar. Open from 11 a.m. to 9 p.m. serving a buffet for those who are vegan, vegetarian or need gluten-free options. Adults $18, seniors, $13; and children under 12, $10. Elevations • 75 S West Temple, (inside the Marriott City Creek) Salt Lake City, 801-537-6019. Holiday buffet from 11 a.m. to 6 p.m. Adults, $42; children 5-12, $15; 4 and under are free. Franck’s • 6264 S. Holladay Blvd., Holladay; 801-274-6264 or http://francksfood.com/#. Serving a four-course gourmet meal that includes starters, caramelized turkey with chickpea-hazelnut stuffing and sweet potato-rosemary relish and dessert. Open from noon to 6 p.m. Adults, $60, children 12 and younger, $30. Finca • 327 W. 200 South, Salt Lake City, 801-487-0699 or www.fincaslc.com. Buffet from 10 a.m. to 2 p.m., with roast turkey, ham, braised beef short ribs, traditional sides, as well as shrimp cocktail, an omelette station, salads, bread and assorted desserts. Adults $45, children 5 to 12, $22.50; 4 and under free. Hub & Spoke Diner • 1291 S. 1100 E. Salt Lake City, 801-487-0698 or www.hubandspokediner.com A la carte brunch available from 9 a.m. to 2 p.m., includes regular menu items and holiday specials. Items range from $9 to $16 for adults and $5 to 8 for kids. La Caille • 9565 S. Wasatch Blvd., Sandy, 801-942-1751 or https://www.lacaille.com/home. Serving a holiday dinner from noon to 6:30 p.m.
Little America Hotel • 500 S. Main, Salt Lake City. 801-596-5700 or saltlake.littleamerica.com. This downtown hotel offers three meal options. The Lucky H Bar & Grill will serve roast turkey, prime rib or salmon dinner with sides and dessert, from 11 a.m. to 9 p.m. Prices are $33 to $38 for adults and $19 to $20 for children under 10. Ballroom buffet served from 11 a.m. to 4 p.m. Adults $73, children 5-10, $34.60 (Price includes tax and 18 percent tip.) children 4 and under free. Coffee Shop opens at 6 a.m. Holiday items available form 11 a.m. to10 p.m. and include roast turkey dinner for $27.95 or prime rib for $30.95. (Rick Egan | Tribune file photo) Customers eat at the Little America Coffee Shop on, Friday, November 29, 2013. Log Haven • 6451 E. Millcreek Canyon Road, Salt Lake City, 801-272-8255 or http://www.log-haven.com/. Serving a four-course lunch from 1 to 5:30 p.m. Includes soup or salad, choice of turkey, salmon, steak or vegetarian entree and dessert. Adults, $56.96; children 3 to 12, $29.95. Oasis Cafe • 151 S. 500 East, Salt Lake City, 801-322-0404 or www.oasiscafeslc.com. Enjoy the regular a la carte menu from 9 a.m. to 2:30 a.m. Menu includes a mix of breakfast dishes such as German buttermilk pancakes, eggs Benedict Florentine and breakfast burritos as well as soups and sandwiches. Silver Fork Lodge and Restaurant • 332 E. Big Cottonwood Canyon Road, Brighton, 801-533-9977 or http://www.silverforklodge.com/. Enjoy a traditional holiday dinner form noon to 6 p.m. Includes soup, turkey, ham, traditional sides and choice of dessert. Adults, $34, children 10 and under $17. Snowbird Ski Resort • 9385 S. Snowbird Center Drive, 801-933-2222 or https://www.snowbird.com/event/thanksgiving/. This resort in Little Cottonwood Canyon has three restaurants open for the holiday. The Aerie, inside the Cliff Lodge, hosts a grand buffet from 11 a.m to 8 p.m. that includes appetizers, soups, salads, turkey, carved ham and beef, salmon, trout, shrimp, pasta, elk and wild mushroom meatballs well as sides and desserts. Adults, $59, children (6 to 12) $31; 5 and under free. The buffet at The Atrium, inside the Cliff Lodge, will run from 11 a.m. to 7 p.m. and will include appetizers, soup, salad, roast turkey and sides, beer-braised beef brisket and an assortment of desserts. Adults, $52, children 6 to 12, $28. The Lodge Bistro, will have a four-course meal that includes soup, salad, choice of turkey, salmon, steak or pork chop entree and dessert. Available from 4 to 9 p.m. Adults, $50, children $26. Thistle & Thyme • 480 Wakara Way, Salt Lake City, 801-581-1000 or www.thistlethymeslc.com. Located inside the University Park Marriott Hotel, this restaurant has planned a traditional buffet from 11 a.m. to 5 p.m. with turkey, sides, a “grazing station” with assorted meats, cheeses and breads, a “build-your-own” mac 'n' cheese bar and assorted desserts. Adults, $40; military and seniors, $20; children 12 and under, $20, 5 and under free. Apex at the Montage • 9100 Marsac Ave., Park City. 435-604-1300 or https://www.montagehotels.com/deervalley/dining/apex/. The Thanksgiving buffet runs from noon to 8 p.m. Adults, $85, children 5 to 12, $40. Brass Tag at Deer Valley • 2900 Deer Valley Drive, E Suite 301, Park City, 435-615-2410 or http://www.deervalley.com/Dining. From 5:30 to 9 p.m., the restaurant will offer a three-course meal for $49 per person. It includes soup or salad, choice of turkey, prime rib or vegetarian entree. Pumpkin cheesecake or apple pie for dessert. Butcher’s Chop House • 751 Lower Main, Park City, 435-647-0040 or http://www.butcherschophouse.com/. Open from 2 to 9 p.m. Serving regular dinner menu as well as a traditional turkey dinner with sides and choice of pumpkin or pecan pie for $35 (adults) or $18 (children). Cena Ristorante • 7815 Royal St., Park City, 435-940-2200 or https://www.the-chateaux.com/dining.html Skip the turkey and enjoy the food at this Italian restaurant inside The Chateaux Deer Valley. Breakfast buffet offered 7 a.m. to 11 a.m.; lunch 11:30 a.m. to 3 p.m. and dinner 5:30-9 p.m. Menu includes fried clams, olive-oil basted cuttlefish, pork belly agnolotti, pizzettas, salads, and classic Italian selections like sausage and rosemary linguine, wild boar mushroom ragu, grilled balsamic ribeye and cioppino stew. (Courtesy Photo) Pizzettas at Cena Ristorante, an Italian restaurant inside The Chateaux Deer Valley. Flanagan’s on Main • 438 Main, Park City, 435-649-8600 or http://flanagansonmain.com/. Traditional turkey dinner with sides and dessert will be available from 11 a.m. to 9 p.m. Cost is $29.95 per person. 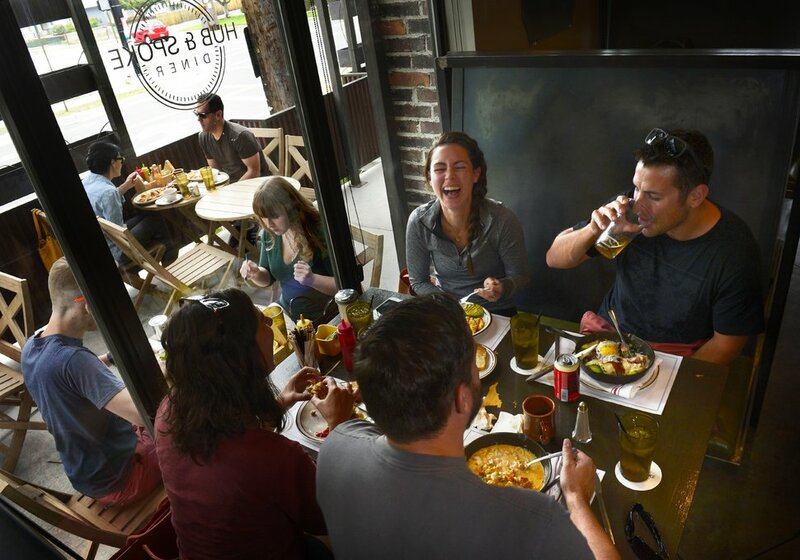 Grub Steak • 2093 Sidewinder Drive, Park City, 435-649-8060 or https://grubsteakrestaurant.com/. This steakhouse, open since 1976, will serve a traditional turkey dinner with side from 2 to 8 p.m. Meal includes choice of Caesar salad or salad bar as well as pumpkin pie or spiced apple bread pudding for dessert. Adults, $34.75; children 12 and younger, $17.75. No Name Saloon • 447 Main St., Park City, 435-649-6667 or http://www.nonamesaloon.net/. For the 18th year, the historic saloon serves a free Thanksgiving buffet with all the trimmings. The feast beings at 2 p.m. Must be 21 or older to attend. Powder at Waldorf Astoria • 2100 Frostwood Blvd., Park City. 435-647-5566 or http://www.waldorfastoriaparkcity.com/dine/. 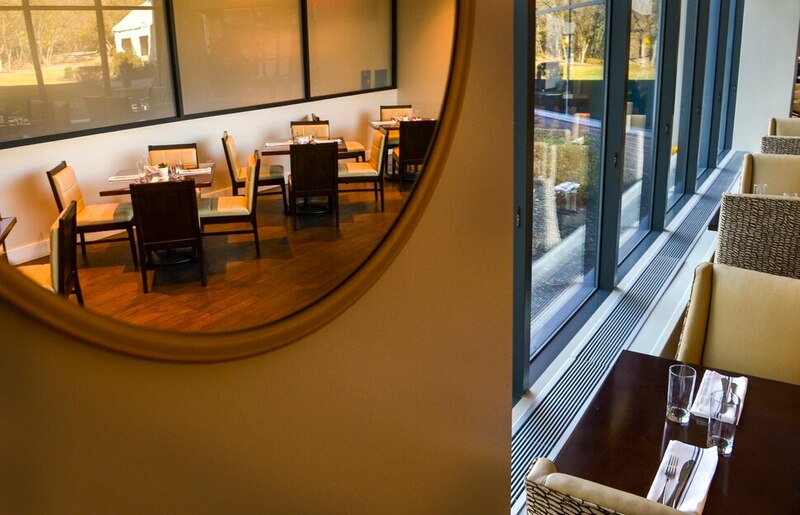 The three-course holiday meal includes soup or salad, choice of organic turkey or short rib of beef and dessert. Available 11 a.m. to 8 p.m. Adults, $55, children 4-12, $35. 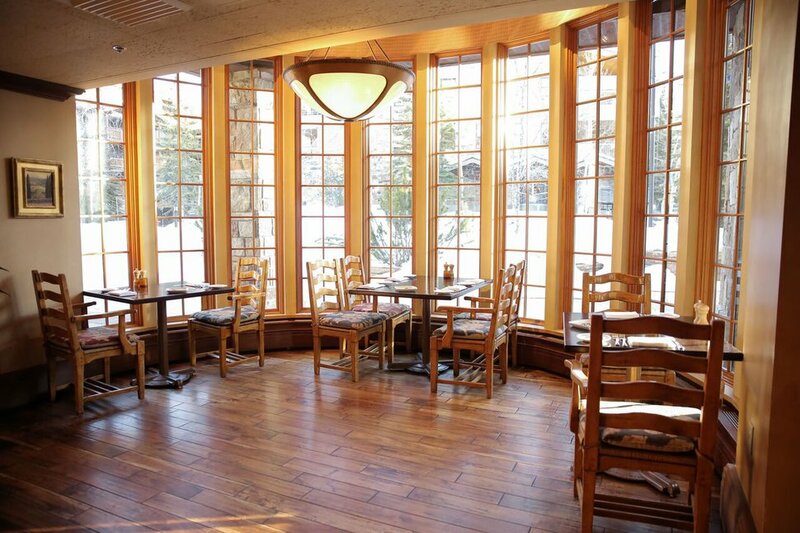 (Courtesy Photo) Cena Ristorante, an Italian restaurant inside The Chateaux Deer Valley in Park City.